Vera B. Williams, an award-winning illustrator and writer of 17 children’s books, who spent a month in a federal penitentiary for participating in a women’s peaceful blockade of the Pentagon, died last Friday. Born on January 28, 1927, in Hollywood, California, Williams moved to the Bronx as a child, studied fine arts at the High School of Music and Arts in Manhattan, and received her BFA from Black Mountain college in North Carolina. It was at this experimental arts college that Vera met her future husband Paul Williams, with whom she would have three children, and fellow artists with whom she would c0-found the Gate Hill Cooperative and the Collaberg School, in Stony Point, New York. Williams worked as a teacher and artist but it wasn’t until she was 46 and moved into a houseboat in Ontario, Canada that she started drawing and illustrating children’s books. In 2004, Williams was the US nominee for the biennial, international Hans Christian Andersen Award, the highest recognition for creators of children’s books. 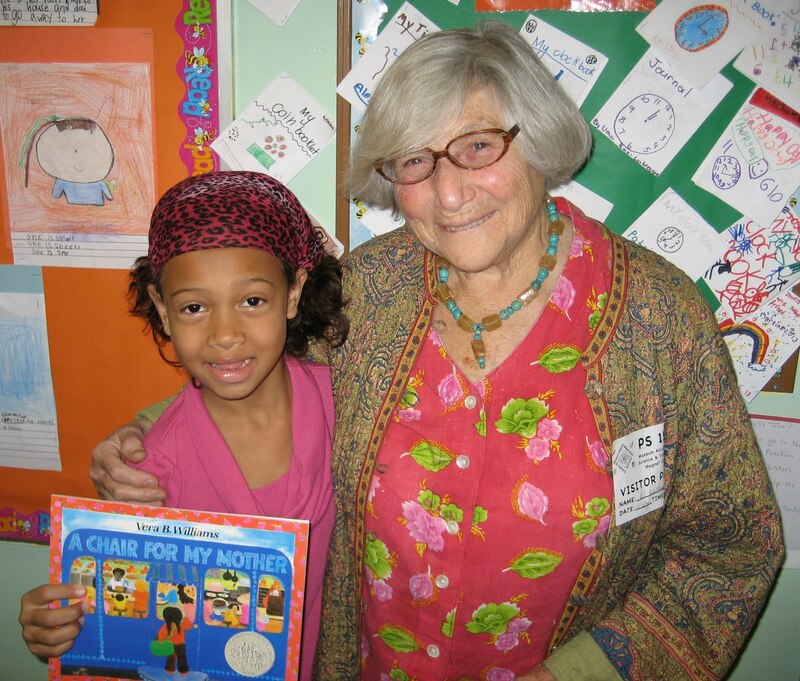 She won the NSK Neustadt Prize for Children’s Literature in 2009 and a Caldecott Medal award in 1983 and 1991. She was also featured in the Library of Congress exhibit “Family, Friends, and Community: The Art of Vera B. Williams,” in 1995. Vera was an activist in life and on the page. She was a member of the executive committee of the War Resisters League from 1984 to 1987, and served a month at a federal penitentiary in Alderson, West Virginia for participating in a women’s peaceful blockade of the Pentagon. Her books are known for their cultural, racial, and socio-economic diversity. One of my personal favorite books as a child was A Chair for My Mother, a book about a young girl named Rosa, who lives with her mother and grandmother with whom she saves coins to buy a comfortable chair after their house is burnt in a fire. It’s also one of Missy Elliott’s favorite books.